Kolas: Kolas represents a lifestyle and culture for anyone ready to take their passion for cannabis to the next level. Swing by the Kolas booth for some fun swag, great industry information and promotions from leading brands, and other surprises you won't want to miss out on. Zippo: Offering a full stock of Zippo lighters, including limited-edition festival designs. Visit early every day for a chance to get access to some of the best "seats" in the house, the Zippo Hot Seat! The official Monster Energy Aftershock mobile app will be available for download starting September 25. 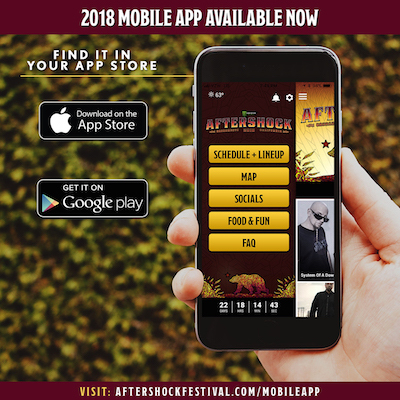 Attendees can build their own schedules, learn more about the artists and personalities appearing at the festival and get the latest must-know information through push notifications. Download it through the Google Play and Apple stores. As previously announced, in addition to performances from top music artists, Monster Energy Aftershock will also feature a variety of onsite food and beverage experiences. Beverages: Festivalgoers 21+ can enjoy a variety of beverages at one of the festival's many bar locations. Specialty experiences include Caduceus Cellars & Merkin Vineyards Wine Garden (owned by Arizona resident Maynard James Keenan, co-founder of international recording acts Tool, A Perfect Circle and Puscifer) and the Belching Beaver Bar (featuring drafts from the Vista, California brewer, including the popular Phantom Bride IPA, a collaboration with Deftones). Coors Light and other beverage options will also be available throughout the festival grounds. Eats: Food and Beverage options will be provided by Southern Hospitality Concessions LLC, DWP's affiliate concessionaire. Patrons can enjoy some of Sacramento's local favorite restaurants, cuisine and food trucks such as: Angry Bird Grill, Bacon Mania, Barrett's Burgers, Bella Familia Wood Fired Pizza, Big Joe's BBQ, Buckhorn BBQ, Cousins Maine Lobster, Deluxe Chinese Cuisine, Dippin' Dots Ice Cream, Dogtown, Drewski's Hot Rod Sandwiches & Twisted Tacos, Florez Bar And Grill, Gyro Stop, Island Noodles, La Terraza, La Mex Taqueria, Master of Patties, Mount Olympus, Pica Pica Arepas, Saucy Lito's, Sausage King, Slider Nation, Smoothie Patrol, Spicy Pie Pizza, Strawberry Fields Wraps and Salads, Thai One On, and What's Poppin' Kettle Corn. Note: Some food offerings are only available in the VIP Lounge (check festival website for details). Since 1993, music industry veteran Danny Wimmer has been producing concerts and festivals, both large and small. In 2011, he formed Danny Wimmer Presents, which now produces several of the largest rock and alternative festivals in the U.S. By combining A-list talent with local cuisine and culture, DWP has become recognized within the industry for delivering the highest-quality entertainment experiences to fans, artists, sponsors, partners and host cities. DWP creates memorable and all-encompassing festival experiences, leaving both consumers and partners with lasting and meaningful impressions. DWP will continue to add new music festivals to its already stellar portfolio, which includes Rock On The Range, Monster Energy Aftershock, Welcome To Rockville, Carolina Rebellion, Louder Than Life, Bourbon & Beyond, Rock Allegiance, Chicago Open Air, and the recently announced Sonic Temple Art + Music Festival, among others.